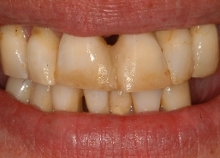 When this lady came to us, she thought she was beyond the point of regaining her smile. 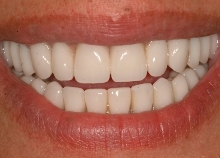 After a CT scan and assessment, we suggested that an implant based fixed upper denture would work very well for her. 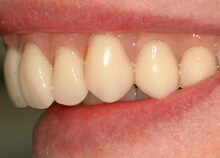 We prepared an Acrylic replacement teeth on a metal frame that is now fixed to the dental implants. 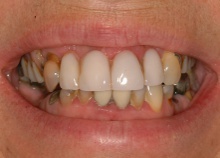 During the treatment, we also fixed two sets of temporary teeth, whilst the denture replacement was being prepared – these alone gave instant improvement to her smile. 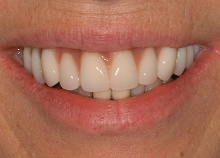 We hope you’ll agree – we were rewarded with a great smile and she’s very happy to regain her smile and confidence back. 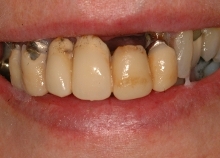 This lovely lady had lost most of her teeth (and confidence) when she came to us. 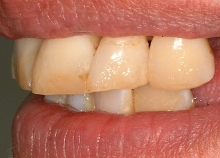 The remaining teeth were discoloured and very wobbly. 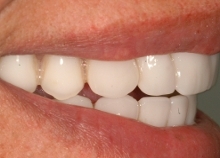 We were able to totally reconstruct her mouth using photographs to match how her teeth were before the problems began! (Yes they were really white and perfect before). 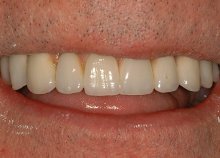 We removed the teeth and fitted a temporary set of implants on the same appointment (immediate improvement) and the final permanent set of implants were fitted 12 weeks later after the gums had finished settling. She can now eat any food she likes and her confidence is completely restored. She is positively beaming! 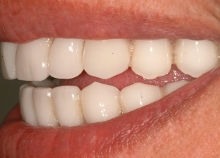 Please note that NOT all implant-clinics will place the implants and temporary teeth on the same day. 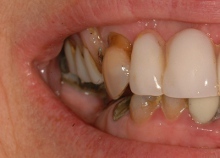 This means that the patient has the teeth taken out and temporary dentures fitted. 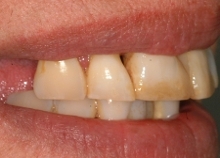 They typically wait 6-9 months wearing ill fitting temporary dentures before having their permanent teeth. 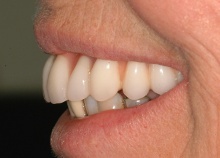 This lady came to us because her old bridge was finally failing completely and had become quite an eyesore. 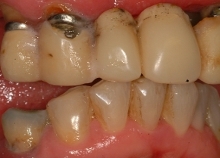 The few remaining upper teeth were decidedly wobbly. 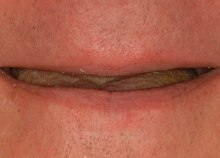 This usually outgoing lady had become quite insecure about her appearance (hiding her smile behind her hand, laughing with her lips pursed and so on) to the point where she had somewhat lost the confidence to go out and about. 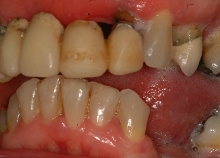 healing we were able to complete the treatment and deliver her new smile in 48 hours. apples and is now worried that she might put on some weight! kept falling out, I felt it was best to come closer to home for the other side,” he said. 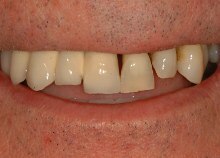 We placed 4 more implants in the upper left side to replace the wobbly teeth and within 10 weeks we were taking impressions to fit the final porcelain bridge. 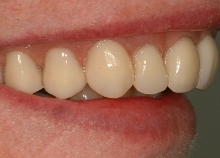 The final porcelain bridge was such an improvement in appearance that we were asked to replace the Eastern European bridge on the opposite side as well to even the score! 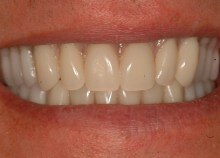 So the after photo actually shows 2 bridges which meet in the middle supported on 8 implants in the upper jaw. and as a result has stopped smiling and lost a lot of his confidence. 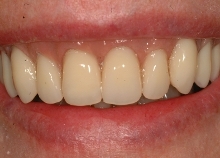 We provided a complete new set of teeth (supported by dental implants in both jaws) within 3 months. 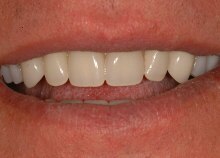 He is now smiling readily and reports that his life has changed dramatically since his confidence is restored.